This kills me and is a lot of the reason why I do what I do. It also relates to HOW I do what I do as well. More on that a bit later. You see, it's that feeling of discouragement and frustration that keeps us outside of a super special space called the Goldilocks Zone. If you haven’t heard of this, I'm sure you’ve heard the children’s story of Goldilocks where she tries a porridge that's too cold, one that’s too hot, and one that’s juuuust right. We’re looking for something similar when it comes to our goals and the behaviors we take to reach those goals. If something is too easy, we get bored, and we stop. If something is too hard, we get frustrated, and we quit. But when we find that sweet spot where it’s challenging, but we still feel like we can figure out how to move forward, that’s where things get good. So, that brings us to a few reasons why you might be having trouble committing to your goals. #1. You don't have a clearly defined "Why." The first is a bit high-level, and it’s that you don’t have a clearly defined “why” for what you’re doing. WHY do you want what you want? What does it mean to you? Is it REALLY that important? If it is, what’s the REAL reason you want this in your life? I’ll share a great exercise with you at the end that’ll help you peel back the layers and help you define a strong WHY for doing something. Once you know why you want what you want, it becomes much clearer and easier to stay committed. Right, you have a deeper sense of purpose for what you're trying to accomplish. This is HUGE. The second is that your expectations are a bit misaligned, particularly when it relates to the timeframe you’ve been promised. Look, you can get a lot done in 60 days of focused effort. You can get a lot done in 30 days. But the outcomes that you seek may or may not align with your timelines. We’re all coming at this from a different place. Some of us may need 365 days to do what others can do in 60 days. That doesn’t mean you're better or worse it just means the person who needs the 60 days likely has more of the existing behaviors in place than whoever might need the 365. We’re all at different places on this journey. 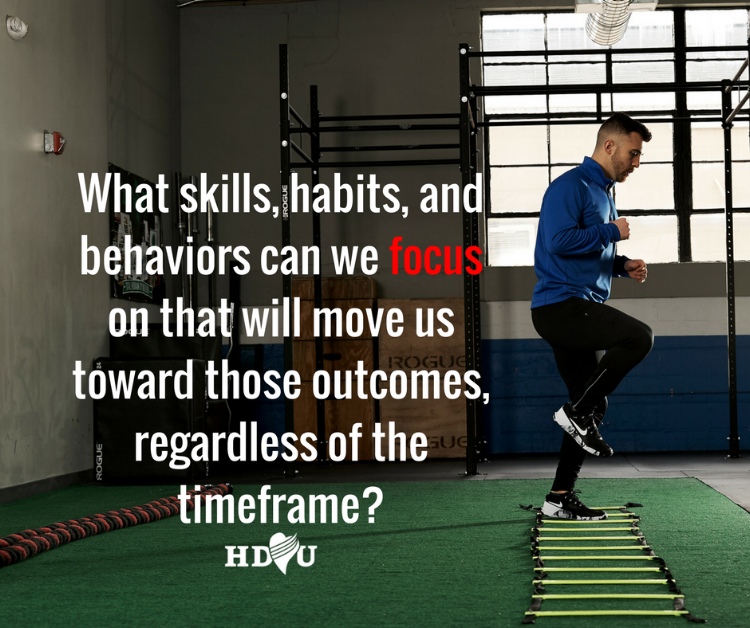 This is why I rarely focus much on the desired outcome beyond defining the initial “why.” Instead, what skills, habits, and behaviors can we focus on that will move us toward those outcomes, regardless of the timeframe. Do the “right” behaviors enough times, and you’ll get there. #3. Your program doesn't meet you where you are. The third brings us back to the Goldilocks Zone I mentioned in the beginning. You see, most food and fitness programs don’t meet you where you are. It’s as if they start you at the end. You have to eat these foods, do these workouts, sleep this many hours, take this stack of supplements, etc., etc., etc. This complete overhaul of, well, everything, often puts us in the “too hard” zone. It’s just too much. Don’t kid yourself. This isn’t your only responsibility. You likely have other commitments that are pulling at your time. Changing everything all at once rarely works, which, if you look back at what you've tried, you'll probably agree. We prioritize, and we iterate. We look at all of the things we think we need to do, figure out which is the most important, and then breakdown priority numero uno into actionable, progressive steps. And these steps are the very skills, habits, and behaviors needed to move you closer and closer to your goals. Remember how I mentioned I don't focus much on the outcome but rather the necessary skills, habits, and behaviors from? See how these are all interconnected. Our goal within the goal is to figure out what we can do today, with at least an 8 out of 10 confidence level, which is more difficult NOT to do than it is to do. Something almost stupidly simple that you may even question how this is going to move you closer to your goals. Yes, this puts us on the “easy” end of the Goldilocks zone, but when we’re just starting out, we’re after one specific thing: momentum. Are you starting to see how you were never really doing everything “wrong” per se rather your approach just needed a bit of refinement?It’s these simple often subtle adjustments, the “How” do we actually bring this to life, which often results in the biggest payout. If you’ve been struggling stay committed, The Perfect Fitness Framework might be just what you need to stop “restarting” and stay committed for good this time. I'm always on your side and I'm always here to help. Fill out the form below and let's talk about how The Perfect Fitness Framework could work for you. Thank you so much for taking the time to let us know more about you and what you're looking to do. You're one step closer to Becoming Your Own Success Story - and the first step is often the most difficult. We're excited to see how the Perfect Fitness Framework can help you reach your goals. From here on out, we got your back. We'll review your answers and reach out regardless of whether or not you are a good fit for the program. If you're not a good fit, we won't just leave you hanging but will make sure you know what to do next to be successful. P.S. I mentioned an exercise to help you uncover WHY your goal is important to you. Head to HeadDownHeartUp.com/5whys and download my free 5 Whys Worksheet.